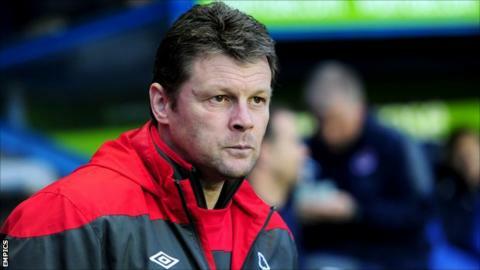 Former Bournemouth striker Steve Cotterill is unlikely to return to the League One club as manager. Cotterill, who left Portsmouth to join Nottingham Forest before losing his job in July, is understood by BBC Radio Solent to prefer a return to management with an ambitious Championship club. The Cherries sacked manager Paul Groves on Wednesday and Cotterill is the bookmakers' favourite to replace him. Cotterill, 48, made 64 appearances for Bournemouth between 1993 and 1996. Cheltenham-born Cotterill began his career at Burton Albion and also had spells at Wimbledon, Brighton and Hereford. He has also managed Cheltenham, Stoke, Burnley and Notts County before taking over at Fratton Park in June 2010. He left in October 2011. He was appointed Forest manager in October but despite keeping the club in the Championship, he was replaced by former Bournemouth manager Sean O'Driscoll when new owners The Al-Hasawi family completed their takeover of the club. First-team coach Dennis Rofe is expected to take charge of the club on Saturday at Coventry, as the club look to appoint a replacement for Groves. Both Yeovil Town boss Gary Johnson and former Cherries boss Eddie Howe have been linked with the position but they have both said they are focused on their current positions. Harry Redknapp, who is employed as an advisor by Bournemouth, has also ruled himself out of the running, while other names linked with the vacancy include Steve Coppell, Glenn Hoddle and Steve Lomas.